Since we are interested in all things tiki here at CFC, when our neighbor/author asked me to design a cover for his new book, even though I was swamped, I couldn't refuse! Drawing from various examples of retro Hawaiiana, I created a cover image that captures the overall feeling of the story. 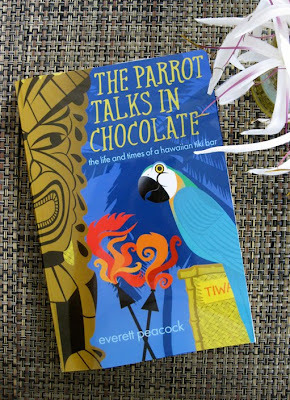 It's the life and times of Tiwaka's, a Hawaiian tiki bar with a resident talking parrot that will dish it out for a chocolate treat. It is, in the author's word's "a light beach read" and in my opinion conjures a fanciful world somewhere between "Casablanca" and "Gilligan's Island"